Sapling Yard wines are hand crafted using grapes sourced from our boutique vineyard in Braidwood together with the finest quality fruit carefully selected from premium vineyards in Murrumbateman and Tumbarumba regions. Located at Charley's Forest 25km north of Braidwood, and at 650 metres above sea level, the property captures breathtaking views of the Budawang Range. Sapling Yard Creek flows across the vineyard, which as the name suggests, is heavily populated with Eucalypt saplings. Grown in these inspiring cool climate surroundings, Sapling Yard produces wines of great flavor and elegance which reflect the natural beauty of the land. The Sapling Yard Shiraz was entered in 3 shows in 2014, 2015 and 2016, NSW Small Wine Makers Show, Wine Wise and the Canberra Regional Wine Show. We won bronze medals in each show in 2014 and in 2015 a silver medal was won for the 2015 riesling. In 2016 the Shiraz viognier accomplished a silver medal while the 2015 Tumbarumba Chardonnay and 2016 riesling one bronze medals. Carla has done an excellent job of creating a course that appeals to those interested in expanding their knowledge of wines. The course provided an in depth look at specific wines each session with so much more detail than I anticipated. We talked about everything wine from the grapes, to the wine making process, to judging, she knew it all in great detail. It was structured such that it made for a really fun, relaxing way to spend the evening, that just happened to have a focused discussion about wine rather than a sit down lecture. If you are a wine professional looking to hone your palate or an avid wine enthusiast who wants to geek out a bit, this course is highly recommended. I attended Carla’s last wine course. It was amazing. I particularly liked how we were able to work through a complete range of white and red wines, fortifieds, and nice bubblies in a small group environment. The personalised learning and Carla’s flexible approach meant that we could ask questions and focus on our particular interests in a very friendly setting. I have attended other courses in Australia and France. However, the knowledge I gained from Carla’s course was, by far, the best and most rewarding. I would highly recommend attending Carla’s next wine course. The course is designed to answer your most asked questions about wine and enhance your enjoyment of wine. An optional dinner will be held at week 6. Carla Rodeghiero and Andrew Bennett planted a small vineyard in 2008, The Vineyard has pinot noir (clones MV5, 777 ) riesling (Yalumba and UC Davis clones), Pinot Blanc, Gamay and a small experimental block of tempranillo. It was a tough beginning, having planted in a drought and caught out in the Albarino savignin fiasco, 660 albarino vines were planted only to discover that they were actually the variety savignin, we have since had to remove these vines and replanted with pinot blanc which is an interesting underated variety planted widely in the Alsace Region in France and also in Oregon in the USA. Our first vintage was 2013 and In 2014 we produced our first wine from the Braidwood vineyard but continue to source the best fruit from the Canberra Region. Silver and bronze medals awarded for all 4 vintages. Andrew and Carla both work full time in the building and pharmaceutical clinical research industries, the vineyard and wine making is driven by a dedicated passion for wine. Carla is the winemaker and started out as a Microbiologist, working as a locum in large hospitals both in Australia and London. Whilst in London Carla worked evenings in a wine bar on Carnaby Street and was mesmerised by the 1993 Mt Langi Ghiran Shiraz and vowed one day to make a wine that rivaled its remarkable character. Returning to Australia she then developed her career and became a Clinical Research Associate, specialising in pharmaceutical clinical trials, of which she is still involved in today. In 1997 Carla began a Wine Science degree at Charles Sturt University and completed her last residential school in 2004 with 9 week old Mia in tow. 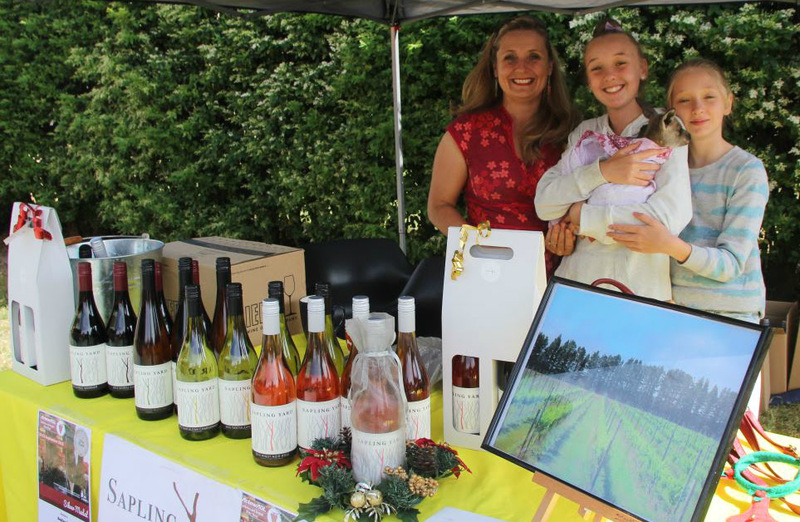 Whilst completing her degree, Carla has worked vintages in both the Hunter Valley, Orange NSW, The Macedon Ranges and the Willamett Valley in Oregon USA. Sapling Yard has just released the 2017 and 2018 vintage having sold out of the 2016 shiraz viognier and 2016 pinot noir. Our wines are made with dedication, precision, authenticity and passion which is clearly displayed in the quality of the wine. We love what we do, and will continue with making small quantities of wine with character and superior quality.